Last week I went to the opening of Anarchy and Beauty: William Morris and his Legacy 1860-1960 at the National Portrait Gallery. I haven’t been to an opening in quite a while – I’m not really part of that world anymore – and it was fun. But more than that: it reminded me of why I love Morris so much. He has played an important role in my life. It was a break for me as a struggling young academic when I became curator of the William Morris Society in the late 1980s and led to my first book, a short illustrated biography of Morris. Later I edited a collection of his writings on art and design. After I’d moved on to a teaching job in Cambridge, I stayed on the committee of the Society, became vice-chair and then chair. Though I’m not actively involved now, I’m still a member and always will be. Morris was a great designer, but if that was all, I wouldn’t admire him as much as I do. A lot of people grow more right-ring as they get older, Morris got more left-wing, and damaged his health working for the Socialist cause. He cared about every aspect of life and this lovely exhibition shows how far-reaching his influence was, right up to the Festival of Britain and beyond. There are textiles, jewellery, ceramics and clothing, books and more. Morris’s ideas about art and society and conservation are as pertinent as ever they were. I can whole-heartedly recommend this exhibition. 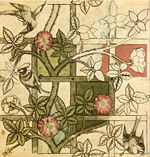 The design above is for Morris’s wallpaper, Trellis. How nice! you’ve confirmed for me that I should see the exhibition. So far I have managed to buy a skirt from Jigsaw in a special William Morris celebratory print to mark the exhibition – feel I should wear it to the Gallery…. Yes, wear it to the exhibition!